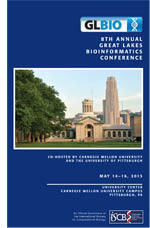 Join us at the Great Lakes Bioinformatics Conference 2013 in Pittsburgh, PA! The conference is organized by the Great Lakes Bioinformatics Consortium to provide an interdisciplinary forum for the discussion of research findings and methods. An important goal for the conference is to foster long term collaborative relationships and networking opportunities within the domain of computational approaches to biology. GLBIO 2013 is co-hosted by Carnegie Mellon University and the University of Pittsburgh, with the conference taking place on the Carnegie Mellon campus. The program will include oral presentations, poster presentations, invited keynote speakers and tutorials. Mark your calendar today and join us at GLBIO 2013, May 14-16, 2013. Registration will be in the Wean Commons (1st Floor) of University Center on Monday, May 13 from 4pm to 6pm and again Tuesday, May 14 at 8:00am. The registration desk will be open throughout the conference hours. NEW IN 2013, THE GLBIO CAREER FAIR! Connecting employers with job seekers in computational biology and bioinformatics. CLICK HERE to download the promotional flyer (pdf). Educating Biologists and Bioinformatics Professionals for the Future - Are We Getting It Right?